United German Hungarians (UGH) have one of the longest histories of any soccer team in Philadelphia. This weekend they celebrate their 100th anniversary by hosting the United States Adult Soccer Association’s National Cup final. UGH have won the competition twice, in 1965 and 1999, having played in the final five times. They also twice played in the final of the US Open Cup and have a long record of league titles. Ethnic social clubs have long been both the starting place and the sustainer of soccer in many communities in the United States. The place of ethnic social clubs in the history of soccer in Philadelphia is no different. English, Scottish and Irish clubs were the founders of soccer in Philadelphia and team names such as Albion, Caledonian and Hibernian reflected the ethnicity of the players. Other team names such Kensington Rovers and Philadelphia North End referenced the names of established teams back in the old country. As immigration patterns changed, new ethnic groups formed new social clubs that soon fielded teams of their own. 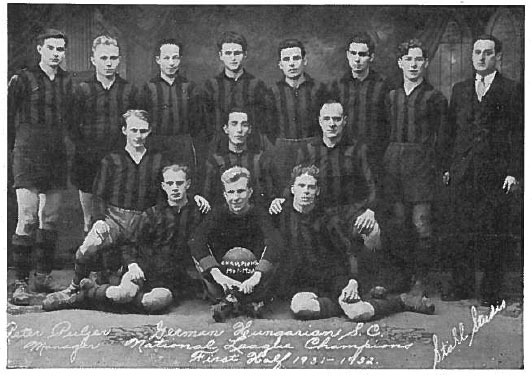 Ethnic German immigrants from the Danubian plains of Hungary founded the club that would become United German Hungarians, which can trace its origins to the Banater Artbeiter-Verein, founded in 1906. The principal activity of the club, apart from providing companionship and community support for people with a shared culture, traditions and language, was the formation of Maennerchors, or male choral groups. In 1910, Banater Maennerchor, the original name of United German Hungarians, was formed with some 48 members. There club was located at Eighth and Columbia until 1923 when they moved to Second and Norris. In the harsh conditions of industrial Philadelphia, Banater Maennerchor and other similar groups would be important places for workers to gather and discuss the hardships of work without the taint of political agitation. 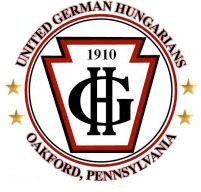 In 1939 the club changed its name to United German Hungarians of Philadelphia and Vicinity. For the sake of simplicity, I’ll refer to the club as UGH. Following the First World War, increasing numbers of German-speaking immigrants began to arrive in Philadelphia and brought with them their love of soccer, a sport which had rapidly spread throughout Europe from Britain in the years leading up to the war. Their love of the game proved infectious and from informal games at club picnics the desire to form a proper team soon took hold. At the time there was a lot more body contact allowed, charging the goal tender was permissible, and these conditions were cause for many rough and hard-fought games. In the meantime the membership of the Sport Section had grown to around the four-hundred mark, and it was therefore necessary to form a Second Team in order to give more members an opportunity to play and at the same time develop players for the First Team. Among those on the team was John Mayerfield, who would later serve as president of the Pennsylvania League, beginning a tradition of UGH playerswho also served the sport of soccer as administrators. That tradition would reach its height when Werner Fricker, captain of the 1965 United States Amateur Soccer Association Open Cup winning team, later became the head of the United States Soccer Federation from 1984 until 1990. During his tenure he led the successful US bid to host the 1994 World Cup. In 1926 the club began to play its games at the grounds at Frankford and Robbins. That same year they traveled to Baltimore for their first game outside of Philadelphia to play the Baltimore Kickers, then considered one of the best German amateur soccer teams on the East Coast. UGH won a “moral victory” in the 1—1 draw “through desire and sheer aggressiveness.” Such spirit led to the club entering their First Team squad into the Second Division of the National League in 1927. The team made it through the first half of the season without being defeated to win “the first-half title.” In 1929 the team entered the First Division and also acquired a new field at Front and Olney. 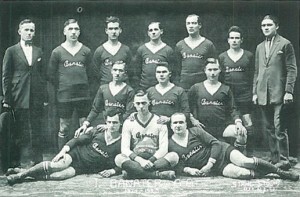 The sport section of Banater Maennerchor had originally been called Banater Athletic Association but in 1930 changed its name to the German-Hungarian Sport Club. The experience of the First Team in the top flight of the league paid off when it won the league’s “first-half championship” in the 1931-1932 season, a feat repeated by the club’s Second Team in the league’s Third Division. In the 1931-1932 season UGH played Philadelphia Passon at Passon Field in Tacony in the first amateur night game in Philadelphia using portable lights mounted on a flatbed truck. They won 4–1. In 1932 the First Team joined the Pennsylvania League, one of the top amateur leagues in the country, and during the 1932-1933 season the club moved to a new field at Rising Sun and Ella. All of the club’s soccer supporters pitched in to build a fence around the grounds in “a singular display of pride and solidarity,” making it the only enclosed pitch in the Pennsylvania League. 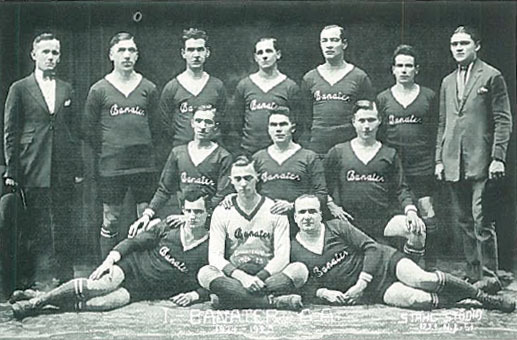 That same year, the team played New York German Hungarians, a semi-professional team that played in the German American Soccer League, losing 4–1. The First Team and its players weren’t the only one’s to perform well on the field. 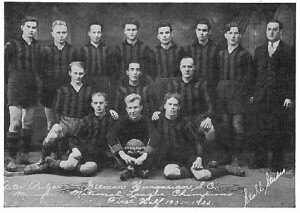 The Third Team won the Philadelphia Worker’s League title in 1936 and the Second Team won the North Philadelphia League championship in 1937. By August enough players had joined this “midget” team to meet the experienced Lighthouse Midgets. 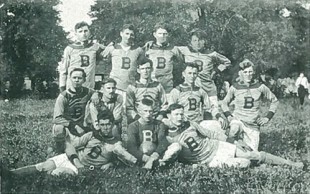 Despite the game ending in a 5–0 loss, “there was no discouragement, but rather a sound realization that much practice, good physical condition and good sportsmanship were requisites for success in competitive sports.” Two of the men most involved in developing the club’s junior soccer program, Ted Kereczmann and Pete Noel, were instrumental in the formation of the “Midget” division of the Philadelphia Junior Soccer League. 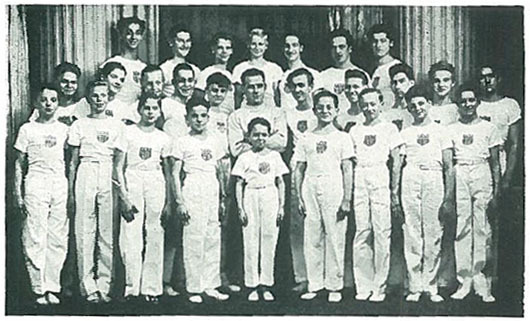 By 1942 the demands on the Junior program, of which soccer was the most popular activity but also included basketball, wrestling and weight lifting as well as a Girls Section, were so great that Kereczmann was forced to make an impassioned plea for assistance from the club’s membership. “The immediate response was rather tepid,” but assistance soon came in the form of a Parents’ Organization. Nevertheless, the demands of the war meant a decline in participation in the Junior Section as young men were drafted or enlisted and parents were involved in the war effort. Despite the decline in participation, the club still needed to field a team in order to maintain its league affiliation. In 1945 a team was entered into the the First Division of the Philadelphia Soccer League and played there for the rest of the 1940s without significant success. But a foundation built on the players of the Junior Section, along with returning servicemen and new immigrants from Europe, promised better things ahead. Along with the Philadelphia German Americans of the professional American Soccer League, UGH was a sponsor of the tour of Hamburg SC in 1950 and the picked team that faced them included several players from the club in the 5–0 loss. Other players were on the picked Philadelphia team that played Stuttgart Kickers in 1952 and lost 10–2. UGH players and teams were doing much better against Philadelphia opposition. Having moved down to the Third Division of the Philadelphia League in 1951, they won the division championship and moved up to the Second Division instilled with greater confidence. On the team were players such as Johnny Jacoby and Matt Noel who were selected to tryout for the US Olympic team, as well as newly arrived immigrants. Still, the Korean War and the draft continued to draw off players and roster numbers declined. This, along with a serious funding crisis, resulted in the very real possibility that the club might not have enough players to field a team. An effective and persuasive recruiting effort resulted in enough players to field two teams. Among those recruited to play on the Second Team, which won the Second Division championship that year, was Werner Fricker, who had recently immigrated with his family to the US. UGH players continued to represent Philadelphia in friendlies against visiting German teams such as Nuernberg, Kaiserslautern and Offenbacher Kickers. And while no trophies would be won in the 1950s, interest in playing was increasing, which lead to the formation of a third team for the 1957–1958 season. 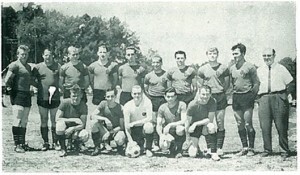 1965 USASA National Championship team. The team was captained by Werner Fricker, who later became president of the USSF. In 1959 the United Soccer League of Pennsylvania was formed. It was at first an “outlaw” organization after it was refused recognition by the Eastern Pennsylvania and District soccer association, and thus by the governing body of US soccer. The league’s origins origins were in United Soccer, a group of German American sport and social clubs that promoted international friendlies. When recognition of the new league was granted in 1961, UGH missed winning the championship but only one point. They then proceeded to win the championship in each of the next six years. In between, in 1962, the club moved to its present location in Oakford, Bensalem Township. From the moment the team landed back in Philadelphia, the club rallied around its team. Naturally, it was a rather downhearted group which landed at Philadelphia International Airport after this disappointing loss, but the tremendous reception by Club members awaiting them upon their arrival quickly dispelled their gloom and instilled in them the determination to show their loyal supporters they had the ability and will to achieve a National Championship…Once the goal of a National Championship had been fixed, a rigorous period of training was established. Rain, snow and sleet were no deterrents. There was a goal to be reached and it could be attained only by strict adherence to rules and regulations. The “Spartan-like” training regimen—aided by the installation of lights at the club’s field in 1963, the first for an amateur club in the Philadelphia area— paid off as “foe after foe was mowed down.” UGH faced Western US Amateur Champions St. Ambrose FC of St. Louis on June 27, 1965. In front of an overflow crowd, St. Louis was mowed down, too. The final was 6–0. The celebrations began early; UGH was up 5–0 at the half. Capitalizing on the club’s national success, a program of international friendlies was begun against amateur teams from Germany, beginning in 1967 against Turngemeinde Heilbronn. UGH lost a close 1–0 game against the visitors bur fared better than the Philadelphia All-Star side, which lost 2–0. The following year, Tennis Borussia Berlin visited. In 1969 came TSV Meinaschaff and Phoenix Durmersheim, followed by Eintracht Lueneburg and Allemania Karisruhe in 1970, the same year that UGH once again reached the National Amateur Cup final, losing to Chicago Kickers. 1971 saw visits by Neustadt-Diespeck and TSV Ottobeuren. In 1972 the club hosted Falke-Steinfeld and FC Perlach. 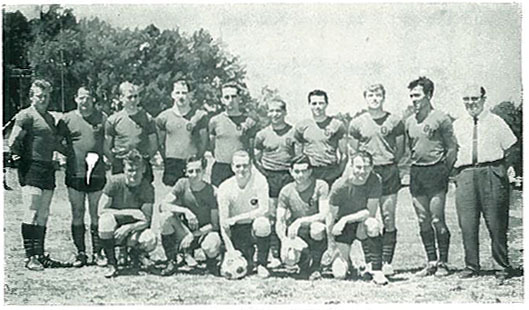 Between the 1959-1960 and the 50th anniversary of soccer at UGH in 1972, the Major team had a remarkable record of 254 wins, 34 losses and 19 ties, winning ten league championships, nine Eastern District championships, three Eastern US Amateur Championships and one National amateur championship. Such success could not go unnoticed and the club drew the attention of the USSF. Three players—Arthur Jethon, Werner Fricker and Otto Brand—were variously selected for the US Pan-American and Olympic teams in 1963, 1964, and 1967. The club continued to expand its youth soccer program, formalized as the Junior Soccer program in 1964. One of the Junior teams, the Junior Red Team for boys aged 15–18 years old, was the undefeated champion of the Inter-County League, which the team joined in 1965, for four consecutive years and was the Eastern Pennsylvania District Champion in the National Junior Cup. The impact at of UGH at the national level continued in 1977 when they appeared in the finals of both the National Amateur Cup and the US Open Cup. Although they lost both games, the first against Denver Kickers and the second against Maccabi of Los Angeles, appearing in two national finals in the same year was a considerable achievement. They reached the final of the US Open Cup again in 1993, losing 5–0 to CD Mexico of San Francisco. Meanwhile, a former UGH player would be central to the US successfully winning the bid to host the 1994 World Cup. Werner Fricker, the captain of the 1965 National Amateur Cup winning team who had been joined the club in the 1952 recruitment drive soon after his family had emigrated to the US, had long served both the club and local and regional soccer organizations as an administrator. By the early 1980s, Fricker was a vice-president at the USSF where, in 1981, he had started the U-20 program. When Colombia dropped out as host of the 1986 World Cup and then USSF president Gene Edwards refused to make a bid, the leadership of the then-faltering NASL turned to Fricker to organize a bid to replace Colombia. Though the bid was ultimately unsuccessful, Fricker’s leadership was recognized when he replaced Edwards to become president of the governing body of US soccer in 1984. Fricker would go on to successfully lead the bid to host the 1994 World Cup. Along the way he initiated the program that insured that US national team players who were not affiliated with a professional team would have contracts with the USSF—personally guaranteeing the line of credit that financed the program. The program was instrumental in the successful campaign to qualify for the 1990 World Cup, the first appearance by the US since 1950. He also oversaw the formation of the US women’s national team in 1985 and the launch of the U-17 boys program. During his tenure, which ended in 1990, he laid the groundwork that turned the federation from insolvency to a successful business by signing the agreement with Soccer USA Partners. It is not an exaggeration to say that Fricker, who passed away in 2001, is the man who built the foundation of US Soccer’s present success. Fricker was inducted into the National Soccer Hall of Fame in 1992 and CONCACAF Hall of Fame in 1996. In 2002, USSF created the Werner Fricker Builder Award in his honor. The club’s connection to the US National Team also includes Peter Vermes, who played in the 1990 World Cup and is currently the coach of Kansas City Wizards. Vermes played at the club in 1987, the year before he won his first cap for the US. UGH closed out the 20th Century by winning the 1999 USASA National Open Cup by defeating the Milwaukee Bavarians 2-1. They lost 7-5 to Detroit Arsenal in the USSF National Amateur Cup a day later. Now celebrating it’s 100th anniversary, the club will host the 2010 National Amateur Cup Final July 30 through July 31, having previously hosted the event in 1989, 1994, 2000 and 2004. The final will feature four women’s and twelve men’s teams in the Amateur, Open and Over 30 competitions. The chairman of the National Cup committee is Werner Fricker, Jr. UGH was only two games away from appearing in the tournament but lost on penalty kicks. Photos courtesy of United German Hungarians. Front and Olney. Best part of the article. Are all of their youth teams taught to play dirty? You don’t have any idea about what we teach our players. We never have and never will teach our players to play dirty. That is not our style and we are better than that. In 1999 The German Hungarians won the USASA National Open Cup, defeating the Milwaukee Bavarians 2-1 in St. Louis MO. The following day the Team lost in the US National Amateur Cup Final to Michigan Arsenal. Thank you Michael. The USASA website lists UGH as the 1999 National Men’s Open Cup champion but doesn’t name its opponent. The Wikipedia entry for “National Amateur Cup” lists UGH as the National Amateur Cup champion in 1999 with Detroit Arsenal as the opponent but doesn’t give the score. The US Soccer History archives, the source for the Wikipedia entry, correctly lists Detroit Arsenal as the 1999 National Amateur Cup champion with the score. None of the sources include match dates.